The weird thing about having a blog in which your friends and family read is that you can't post anything that you are working on. So, really it looks like I could be twiddling my thumbs around this place. And, perhaps, at times I am, but really I have been working on some fun things that I cannot show at all. So, that got me thinking that I might want to share some things that I am not working on, but think you all might want to. Last year my mom sent the grand kids these wonderful Christmas pillow cases for them to open on Christmas Eve and put on their pillows to have magical dreams. She also wrote a great poem to go with them and sent two books - Snowmen at Night and another one along those lines. I thought this would be a great gift for families. 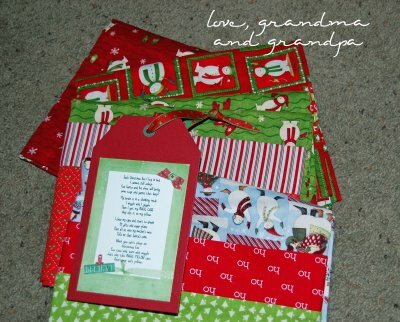 This year we are picking family names instead of individuals on my husband's side of the family and it would be great to make these for each child in the family we pick. Here is a tutorial for a fancy pillow case from Kirsten Can. In the mean time you can decide who you are giving these to and print up this cute poem. some toys and games that beep! And slip it on my pillow. Of gifts and sugar plums. Tells me that Santa's come. what a sweet idea. how thoughtful. I'm always amazed at what people make and give for gifts. That is a fun gift; my step-mom made my boys both a pillowcase for my oldest son's birthday from Christmas fabric. I have also, for years, given personalized pillowcases to the children in my siblings' families when it is my turn to give to that family. Cute poem too. I might borrow it this year. What a cute poem and great idea! Its a very good blog for gifts knowledge. But, you can get more knowledge about Christmas Gifts.